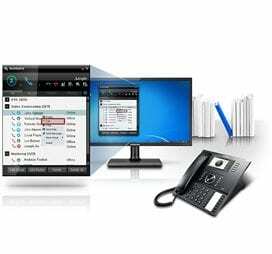 Voice over IP or VoIP, is simply using the internet for voice and data communications, and it has many benefits over traditional phone systems for any size business. So many in fact, VoIP is expected to overtake landlines, and it’s not a matter of if, but when. Recent estimates point adoption of VoIP in US businesses near 40%, with the percentage expected to climb past 50% in early 2015.
c2mtech has 39 years of combined experience in telecommunications. We’ve been an advocate of VoIP from its infancy and have implemented thousands of VoIP phone systems for small, medium and enterprise businesses throughout Texas. The early adopters who we enabled to make the ‘switch’ have experienced many of the benefits listed below over traditional lines. Due to growing adoption and increased competition, all forms of VoIP installations have become business friendly. While there were several disadvantages of VoIP in its early years, such as voice quality and reliability, improvements in VoIP technology and Quality of Service guarantees from service providers have eliminated latency and service outage issues. Unlike other VoIP consulting companies, c2mtech installs and maintains all forms of analog, digital and VoIP business phone systems. We begin with a joint audit of your business analyzing costs, demand, expected business growth and more. Following a review, we will recommend hardware from our diverse group of established partnerships and a choice of installation from all VoIP options available, listed below. On premise VoIP uses a sever vs. a traditional PBX and operates completely on IP or Ethernet cables vs. traditional phone lines. Other forms of setup for on premise VoIP include hybrid solutions allowing for traditional phone lines combined with VoIP technology. This type of VoIP is on location, so it can be more secure than hosted VoIP. c2mtech installs and maintains VoIP that follow the standard SIP (Session Initiated Protocol). As a result, clients have flexibility to choose from a variety of phone receivers, and plans with installation and maintenance costs minimal. Hosted or cloud- based VoIP/PBX leverages a shared network of servers that handle the processing of data and voice communications. Many large enterprises and multi-location businesses find hosted VoIP to be an economical solution as it requires no onsite physical infrastructure such as an IP PBX, which is required for calls to be routed to different extensions. As a result, the lack of PBX on site in multiple business locations can reduce fixed costs, implementation and hardware maintenance. However, hosted VoIP can have higher costs long term, as the hosting is paid to service provides each month, perpetually. On Site VoIP tends to be the most economical solution for small businesses with fewer than 20 locations and existing PBX infrastructure. Hosted PBX tends to be the most economical system for enterprise businesses, especially with many locations or when new locations are added frequently. As more locations are added, the cost of installing on site VoIP and routine maintenance can outweigh the monthly hosting service costs. On premise VoIP can be controlled and managed more than Hosted PBX and is a better option for businesses with a need for high security. For recently created businesses without PBX infrastructure, hosted can be a more economical solution up front. For 39 years, c2mtech has grown to become one of the largest independent telecommunications consulting companies in Texas. Our size allows us to offer quantity discounts and extensive warranties, ensuring your equipment is budget friendly and long lasting. Start with a telecom audit. You bring the bills and insight on your business, and we’ll add our 39 years of experience in telephony solutions. You’ll receive unbiased recommendations tailored to your business, as c2mtech partners with all major business phone system brands, VoIP hosting providers, and internet service providers.